Sikkim is an Indian state located in the Himalayan Mountains. The state shares its border with Nepal, Tibet, Bhutan and West Bengal. 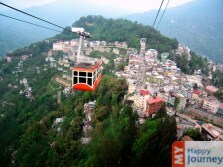 Sikkim is the second smallest state in India and it is the least populous state in India. Kangchenjunga world’s third highest peak is located in Sikkim. Sikkim is a famous tourist sport. Tourists from all over the world visit Sikkim to enjoy its scenic beauty and its cultural heritage. Sikkim is known for its huge variety of flowering plants which add to the beauty of this place. Some of the forests as are rich in these types of plants are magnolia, primulas, blue poppies, geraniums, and gentians. Besides these orchids, azaleas, gladioli, poppies, azaleas, and camelians also enhance the beauty of this mountainous region. Sikkim has a rich fauna; this state is a dwelling place for a variety of animals for example The musk deer, the barking deer, Himalayan black bear, red panda, red goral, blue sheep, shapi, snow leopard etc. The rich flora and fauna of Sikkim attracts the visitors. Climate of Sikkim is different from rest of India. Summer is from May to October, but abundant sunshine is witnessed between March and May. Winter season is from November to February. Temperature during January and February falls to as low as 4 degree Celsius. Sikkim witnesses heavy rains throughout the year. However the months of May, June, October and November experience less amount of rainfall. Famous tourist attractions in Sikkim are Jawaharlal Nehru Botanical Garden, Buddha Park, Pelling, Ravangla, Teesta River, Yumthang valley.